Motherwell FC's 2018-2019 Scottish Premiership season began in disappointing fashion in a 3-0 reverse at Hibernian on Sunday, writes Craig Goldthorp. Hibs were clinical with their finishing on a day in which Motherwell's substitute striker Danny Johnson missed two great chances and had a 'goal' disallowed. It was Well's first game since the £1 million sale of defender Cedric Kipre to English Championship side Wigan Athletic. Despite his move, Kipre and members of his family turned up in Edinburgh to watch the match from the Main Stand. The fiercely competitive opening saw a lack of chances created in the opening 25 minutes. A long ball into the Motherwell penalty area on 14 minutes saw Stevie Mallan's shot blocked by Aaron Taylor-Sinclair. Four minutes later, a Taylor-Sinclair cross at the other end was partially cleared to Liam Grimshaw whose left footer sailed wide. It was a game lacking spark but that changed after Hibs were awarded a 28th minute free-kick on the edge of the box when Mallan's shot was handled by Peter Hartley. Mallan himself stepped up and struck a right footer with authority past Motherwell keeper Trevor Carson and into the right corner. The Steelmen fought hard to try and get back level and a fine passing move in the 43rd minute which culminated in Andy Rose having a shot blocked after Taylor-Sinclair's pass. And wouldn't you just know it. Hibs broke away to make it 2-0 straight away, with McGinn's fine ball to the back post was finished by Oli Shaw who shot under Carson. Motherwell manager Stephen Robinson responded by making a double half-time substitution, with Gael Bigirimana and Elliott Frear replacing Taylor-Sinclair and Grimshaw. But the changes didn't have the desired effect for the Steelmen as Hibs continued in the ascendancy and Paul Hanlon's left footed cross-shot had to be parried by Carson. However, it was 3-0 on 50 minutes when Martin Boyle was afforded too much room and ran through with little resistance before shooting emphatically home. 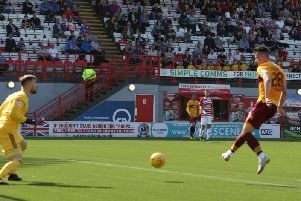 Motherwell came agonisingly close to pulling a goal back when MacLaren's misplaced pass sent sub Danny Johnson through on goal but his shot from the edge of the box came back off the inside of the post. Johnson's effort from the rebound was blocked. Play raged to the other end where MacLaren's effort was saved following a pass inside by Stevenson. Johnson was then again sent through on the keeper for Well but Adam Bogdan blocked. And the former Gateshead striker scored with a left foot shot from the edge of the box on 85 minutes, but the 'goal' was confusingly disallowed by referee Bobby Madden for an earlier infringement. Motherwell play their second league game at home to Hamilton Accies this Saturday. Motherwell: Carson, Tait, Taylor-Sinclair (Bigirimana 45), McHugh, Hartley, Cadden, Main (Johnson 62), Grimshaw (Frear 45), Rose, Sammon, Donnelly.